ESPN has updated its fan misery index, and the Bills now have the most miserable fan base in the NFL and the Sabres have the second-most miserable fan base in the NHL. The most miserable distinction in the NFL had previously belonged to the Cleveland Browns. The most miserable distinction in the NHL belongs to the Florida Panthers. Bills fans also rank No. 3 in all of sports and the Sabres ranked No. 10, according to ESPN's formula: Only the Sacramento Kings and San Diego Padres finished with fewer points than the Bills. The formula is based on championships, playoff berths, playoff wins, heartbreakers and rival comparison (meaning that the New England Patriots, which have the least miserable fan base per ESPN, impact the Bills). The formula also takes into account the recency factor so the drought before the Bills made the 2017 playoffs has more weight than those four Super Bowl appearances in the 1990s. 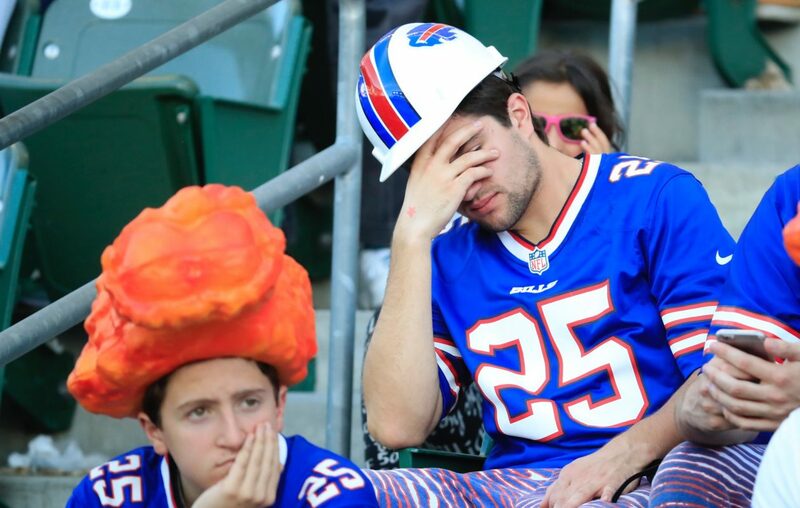 "The Bills leapfrogged the Browns and are now the most miserable fan base in the NFL. This happened mainly for two reasons – Buffalo predictably backslid after making the playoffs in 2017, and their fans had to deal with the horror of a sixth Patriots Super Bowl title since 2001. Buffalo has now missed the playoffs in 18 of the past 19 seasons. The rival Patriots have been to 10 Super Bowls since the Bills last won a playoff game (which came in 1995, by the way). In the meantime, the Bills have been through seven head coaches, two interim coaches and countless quarterbacks, were the victims of the "Music City Miracle" and now have to cross their fingers and pray that Josh Allen is their long-awaited franchise quarterback. It's not a fun life, and losing four straight Super Bowls doesn't seem so bad anymore." Where they're especially miserable: The fact that the Brett Hull "in the crease" heartbreak in the 1999 Cup Finals was their recent high-water mark. That was a terrible way for the Sabres to lose a chance at the Cup, but their performance since then has been rough, as they haven't made the playoffs since 2011 and haven't won a playoff series since 2007. Rays of hope: Winning hockey is definitely doable in Buffalo, as the Sabres made the playoffs 13 times in 14 seasons from 1988 to 2001. Sabres fans have also been blessed with top-level goaltending over the years in Dominik Hasek and Ryan Miller and get to watch one of the best young players in the game now in Jack Eichel. Trend: The Sabres showed potential this season thanks to Eichel and a big year from new acquisition Jeff Skinner. Even though they fell off late and didn't make the playoffs, there's hope for the first time in a while.